FEW bureaucrats have wielded as much power as Mr P.C. Alexander. He has a knack to cultivate those in power. He was Principal Secretary to two Prime Ministers – Indira Gandhi and her son Rajiv Gandhi. When a state government starts unfolding plans and packages, it means two things. One, the term of the present Assembly is about to end. Two, the party in power wants to be a step ahead of the model code of conduct for free and fair elections. France recently passed a controversial law against the public display of religious symbols. For this reason alone the French would certainly not be amused to learn that the purdah, for long seen as a symbol of repression of women in Muslim societies, is now becoming as popular in Kerala as it is in most Islamic countries. The road to hell, it is said, is paved with good intentions. So is the highway to economic ruin, especially in a country like India where politics of the most opportunistic kind rules the roost. Not only that, the country is still saddled with Fabian ideological concepts which impeded economic growth in the immediate post-Independence years. Some years ago, my cousin had her seven-year-old son studying in the renowned University Ligget School located in Grosspointe Wood, Detroit, near the Henry Fords’ sprawling bungalow close to Lake Huron. A great grandson of Henry Ford, Stephen, was a classmate of Ritik. They were good friends. 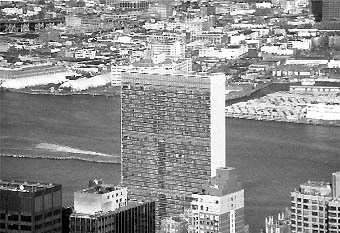 The world spotlight is on the United Nations headquarters in New York. The 59th regular session of the United Nations General Assembly (UNGA) commenced on September 14. The United Nations spiritual predecessor, the League of Nations lasted 27 years (1919-46). By the longevity yardstick, the UN has done considerably better. The BJP is in a quandary these days as it is unable to find a suitable strategy to tackle its temperamental and impulsive leaders like former Madhya Pradesh Chief Minister Uma Bharti. And to cap it, there is no dearth of them in the party. FEW bureaucrats have wielded as much power as Mr P.C. Alexander. He has a knack to cultivate those in power. He was Principal Secretary to two Prime Ministers – Indira Gandhi and her son Rajiv Gandhi. He was also an unofficial advisor to Mr P.V. Narasimha Rao. When he was the Governor of Maharashtra, he became so close to Shiv Sena chief Bal Thackeray that the latter made him a member of the Rajya Sabha. He was privy to several momentous decisions. He also played a major role in the decision-making process. So, when he says he has bared it all in his latest book Through the Corridors of Power, it is bound to get notice. Mr Alexander's comments on Operation Bluestar are noteworthy as he headed the Prime Minister's Office at that time. If he is to be believed, Indira Gandhi had only approved of the general plan to smoke out the militants holed up in the Golden Temple. She had no say whatsoever in the flawed strategy the Army followed which resulted in bloodshed and severe damage to Akal Takht. For good measure, the author also adds that as a rule Indira Gandhi never criticized the Army either in private or in public even if she was convinced about its lapses. In other words, he gives a clean chit to the then Prime Minister while putting the entire blame at the door of the Army commanders. As it turned out, Operation Bluestar was one of the gravest blunders the government committed. Indira Gandhi paid for it with her own life. Far from nipping militancy in the bud as was expected, it gave it a further lease of life. Neither did she atone for the lapse nor did she take any action against those who mishandled the situation so much that an entire community was angered. She had ample opportunities to make amends for the lapses till she was gunned down by her own security guards. The promotions that some of the Army commanders received in due course bear out that there was no realisation in the PMO that Operation Bluestar was botched up. It is, therefore, difficult to concur with Mr Alexander when he says Indira Gandhi was not to blame for the operation. When a state government starts unfolding plans and packages, it means two things. One, the term of the present Assembly is about to end. Two, the party in power wants to be a step ahead of the model code of conduct for free and fair elections. With less than six months left for Haryana to elect a new Assembly, Chief Minister Om Prakash Chautala has suddenly woken up to the plight and backwardness of the Mewat belt. By having supped with the Bharatiya Janata Party he is not sure of the support of the Muslim voters. Since 70 per cent of the population in Mewat is Muslim the message contained in the decision to give the most backward region the status of a district is obvious. Whether the initiative will help a million flowers of progress and development bloom will not be known immediately. That suits the politicians because they thrive on promises, not performance. The ones in power have to leave some work unfinished until the next elections. In Haryana, both the Congress and the non-Congress parties share a common history of trying to win over foes and influence voters when the four-letter word called poll begins to haunt them in their sleep. Many more sops can be expected in the coming weeks to help Mr Chautala regain lost ground. An aware electorate would have taken politicians of all shades to task for the criminal neglect of the region when it was part of Punjab and now as an insignificant part of Haryana. But awareness comes only when people are educated enough to chart their economic future. Mewat be just a handshaking distance away from Delhi. While Faridabad and Gurgaon have developed into well-developed counter-magnets to the national capital, Mewat continues to be afflicted by all the ills that raise questions about the integrity and vision of the politicians in power. Maulana Azad won the first Lok Sabha election from here. But it did not change Mewat’s social and economic destiny. Will making it a district on October 2 do the trick? France recently passed a controversial law against the public display of religious symbols. For this reason alone the French would certainly not be amused to learn that the purdah, for long seen as a symbol of repression of women in Muslim societies, is now becoming as popular in Kerala as it is in most Islamic countries. What is likely to add to their state of confusion is the high literacy rate of Malayalees. Over 85 per cent of Kerala’s Muslim women are educated. Why blame the French, an aware Indian would be equally rattled by the apparent cultural and social reverse swing. After all, Muslim women in India are demanding sweeping changes in the customary laws. However, in Kerala they are voluntarily moving back in time, as it were. Why? Part of the reason lies in the Kerala Muslim’s job profile. Every second home is bringing back petro-money and Arab customs from Saudi Arabia, which has the largest concentration of Muslims from South India. However, the purdah by the time it reaches Kerala is redone. Designer veils make women look more attractive. With veils that reveal as much of the face as they conceal, outsiders may be led to believe that they have walked into a live presentation of the famous Arabian Nights. The fundamentalists are, of course, not amused. However, in the general context Muslim women had somewhat lagged behind other communities in reinventing religious symbols as fashion statements. Take, for instance, the mangalsutra. The market forces now produce an amazing array of rakhis for celebrating Rakshabandhan. An enterprising resident of Patiala has turned the art of tying turbans into a money-spinning venture. No turban is tied without prior appointment. Christian and Jewish religious symbols are constantly redesigned to blend with the latest fashion trends. There is no evidence to suggest that Kamala Das in her new avatar as Suraiya played a role in making purdah become a rage among Kerala’s Muslim women. The road to hell, it is said, is paved with good intentions. So is the highway to economic ruin, especially in a country like India where politics of the most opportunistic kind rules the roost. Not only that, the country is still saddled with Fabian ideological concepts which impeded economic growth in the immediate post-Independence years. The wayout is obviously a bold new approach, which Dr Manmohan Singh demonstrated when he was Finance Minister more than a decade ago. His policies of the time were the first major steps to enable the country to dispense with policies which, in the words of the present-day Finance Minister, Mr P. Chidambaram, “stifled the spirit of enterprise”. Therefore, when the reformer of 1991 became the Prime Minister, the expectation was that the “spirit of enterprise” would be rekindled. Indeed, one might be tempted to deduce from Dr Singh’s observation at his recent Press conference that “this country needs large doses of foreign investment” that the policies of liberalisation will be seriously pursued. However, his other remark about the extension of the quota system from the shrinking public sector to the slowly blossoming private sector can suggest that he is talking at cross-purposes. It will be naïve to believe that the prospective foreign investors as well as the domestic ones will be delighted to hear that the government is contemplating reserving jobs for Dalits, adivasis, OBCs and other groups in the private sector. What is distressing about this statement is that the ambit has already widened from the earlier plea for preferential treatment for only Dalits and adivasis to the “usual suspects” — the ubiquitous OBCs — and other still unidentified groups. One can presume that these will include the minorities, the poor from the upper castes and, perhaps, women as well. It is also necessary to remember that it was the announcement of affirmative action for the OBCs in the early nineties which not only strengthened regressive caste-based politics but also gave a fresh lease of life to communalism as the BJP played the Hindu card to counter the influence of the casteist regional parties. Clearly, what we are now facing is a virtual open-ended recruitment policy under which various pressure groups can hope to be accommodated, leaving little option to the owners of the companies and factories to appoint people of their own choice. It doesn’t take much perspicacity to understand that there is no surer way to stifle the spirit of free enterprise. Once the foreign companies realise that they will be held hostage to politicians bent on using the job quotas to consolidate their vote banks, the prospective investors will bid a speedy goodbye to India. As it is, the FDI scene is not too bright. From $ 4.74 billion in 2000-01, the highest the country ever received in a single year, it dropped to $ 4.69 billion in 2001-02, $ 3.73 billion in 2002-03 and $ 3.57 billion in 2003-04. Evidently, the falling figures suggest that the government should do everything in its power to smoothen the way for more investment, especially when impediments such as outdated labour laws still prevail. These frown even on the contract system of employment, let alone allow the policy of “hire and fire”. Besides, there are other disincentives to investors such as a high tax regime and poor infrastructure. The central fact which the policy makers will have to take into account is that the investors are not philanthropists. They do not run charity outfits. They are in the business for money and are driven by an intensely personal agenda made up of ambition and self-interest, both at the individual and corporate levels. This is the engine of capitalist development which now prevails all over the world, except in the few decrepit socialist outposts like North Korea, Cuba, Laos and Vietnam. Even China’s so-called market socialism has more market in it than socialism. It will be foolish to ignore this stark reality of economic life in preference to an idyllic world of do-gooders. If the latter claim that India will establish its own economic norms, where companies will function for the benefit of the underprivileged even if this means that they will incur losses, then the world will pass it by. It is this indisputable aspect of the market economy which sections of the Left have learnt through bitter experience in West Bengal, especially the state’s Chief Minister, Mr Buddhadev Bhattacharya. When the communists drove the capitalists out of the state in the sixties and seventies with their militant trade union politics, they presumed that they were serving the common people. The profit motive was lambasted and even films by Satyajit Ray like “Seemabaddha” and “Jana Aranya” showed the corporate world as full of sharks, depriving the workers of their rightful dues. Some of this may well be true. There are fewer angels in this world than their opposites. But even the Left has now understood that the capitalists may be wicked, but they are still needed to invest and provide jobs. If India doesn’t want to emulate West Bengal to become an industrial desert, it shouldn’t repeat the state’s mistakes. What is curious, however, is that while at least some West Bengal politicians have finally woken up to the harsh realities of economics, there are others like Mr Laloo Yadav and Mr Ram Vilas Paswan who simply do not seem to care. Their focus is so exclusively on their casteist constituencies that they are oblivious of almost everything else. Their firm conviction is that if they are able to keep their caste groups — OBCs in Mr Yadav’s case and Dalits in Mr Paswan’s — reasonably happy with at least promises of jobs, then they are not bothered if the state sinks deeper into backwardness. To them, and to their supporters in the countryside, the roads have always been bad, sources of water supply few and far between and electricity a novelty. They are not too concerned, therefore, if there is no immediate sign of change as long as the leaders from their own preferred castes remain in positions of power. It is against this background that one can understand Mr Yadav’s long diatribe against the IT sector during a Planning Commission meeting. It is this kind of a segmented approach which has been the bane of India, with the BJP intent on placating only the communal-minded Hindus, the communists only their trade union bases and the regional parties of the Hindi heartland only their traditional casteist vote banks. Mercifully, the Congress’s return to power means that a genuinely national party may be able to break away from the stranglehold of such a sectarian mindset and be able to balance both political compulsions and economic imperatives. The party is also lucky in having in its ranks people of high academic qualifications, who have succeeded in shedding much of the organisation’s earlier ideological baggage. Nevertheless, they have to be on guard to ensure that they are not misled by noble-sounding but essentially unrealistic rhetoric into adopting measures which still stifle growth and generate more poverty and distress. Some years ago, my cousin had her seven-year-old son studying in the renowned University Ligget School located in Grosspointe Wood, Detroit, near the Henry Fords’ sprawling bungalow close to Lake Huron. A great grandson of Henry Ford, Stephen, was a classmate of Ritik. They were good friends. They shared all their innocent jokes and laughs. A chauffeur-driven large Ford car was in attendance throughout. My cousin and ourselves shared a residence in Park Avenue, Detroit. One forenoon a postal van stopped in front of our verandah. A delivery postman struggled to push a 68”x48” size parcel through our main entrance. The large birthday gift from the Ford household contained a latest wall type colour TV for Ritik with a revolving Micky Mouse motif. We thanked Stephen’s mother Christina Ford. She invited us for tea as well as a sea trip next day to their favourite island near Owen Sound close to Canadian border. Next day we were at the large gate facing a large guide map of the Ford estate. The massive household was served by hundreds of attendants carrying out different chores. We entered after an electronic check for a further drive towards the inner conclave. Another gate and more security guards. We disembarked and walked ahead for a physical security check by high-profile monitoring equipment. Introduction over, we were seated on a large 40-seat dining table. The menu for high tea was engraved on carry-home sterling silver stands with name of each participant. Each one of us was also given a tiny scale model of Ford Ikon car which was going to be launched in the US then. More was to come. We were conducted towards a Ford family private ship. Lake Huron was quiet and calm when we boarded her at 7 p.m. Soon it started blowing with wind force 7 and the ship could not rush back alongside due to prevailing stormy conditions. All forgot about the lavishly prepared almond cake, Mexican cheese toast etc baked for us. It was already midnight with pitch darkness around. A small boat attempting to reach the ship perished. The captain decided to lower the large net using powerful search lights. Christina Ford Stephen and others were removed from the ship to a motor boat, slung in a large net herded together like fishes in a fishing net. The magnanimity and cordially of the Ford family was a tribute to their traditional hospitality in extending which they took serious risks. The world spotlight is on the United Nations headquarters in New York. The 59th regular session of the United Nations General Assembly (UNGA) commenced on September 14. The United Nations spiritual predecessor, the League of Nations lasted 27 years (1919-46). By the longevity yardstick, the UN has done considerably better. Is the organisation in ascendance or, has it reached a climacteric head? Weighty issues concerning world peace, niggling misgivings about the UN’s relevance to their problems and doubts about current health of the world body are likely to engage the minds of world leaders and diplomats when they address the UNGA or hobnob on the sidelines of the Assembly. How does the UN look at 59? Various standards could be applied to gauge the health of the organisation, but the benchmark measure must remain the purpose for which the organisation was conceived and brought into being on October 24,1945. The United Nations was founded, in the words of Preamble to its Charter, in order “to save succeeding generations from the scourge of war.” Meeting this challenge is the most important function of the organisation, and to a very significant degree it is the yardstick with which the organisation is judged. Article 1 (i) of the UN Charter lays down the primary purpose of the world body as: “To maintain international peace and security, and to that end, to take effective measures for the prevention and removal of threats to the peace, and for the suppression of acts of aggression or other breaches of the peace, and to bring about by peaceful means, and in conformity with the principles of justice and international law, adjustment or settlement of international disputes or situations which might lead to a breach of the peace.” All member-States are bound by the Charter of the United Nations or, so at least in theory. While delivering the Madhavrao Scindia Memorial Lecture at New Delhi on February 13 this year, the French Foreign Minister, Dominique De Villepin, stressed: “The Security Council is alone in having the required legitimacy to authorise and support the use of force.” Monopoly over the use of force is also a defining characteristic of the modern state. Laissez-faire in the matter of force is invitation to chaos. It is this very primacy of the United Nations that is under challenge and could lead to destabilisation of the international system. It is no secret, in 2003; America and the UK went over the United Nations head, attacked and occupied Iraq. Later, the US tried to get the United Nations to sanction a UN Peacekeeping Force for Iraq under the garb of giving a role to the UN in managing Iraq. The UN refused to take the bait. The US was thus frustrated in its attempt to raise its unilateral intervention to universal level by involving the UN. That must count for some success, though not being able to restrain America was adjustment to political reality of the times-a bitter pill the UN was forced to swallow. There are other disturbing portents. Bradley Graham in his article “Bush Plans Aid to Build Foreign Peace Forces” (Washington Post, April 19, 2004) writes that President Bush had approved a plan “Global Peace Operations Initiative” that required the US to commit about $660 million over five years to train and equip forces in nations willing to participate in peacekeeping operations. Pentagon officials who briefed the Washington Post said the plan grew out of the Administration’s struggle to recruit enough foreign forces for peacekeeping and was meant to expand worldwide capacity that could be used by the UN or others. The US has decided to help itself — of course with the highest of motives! The other emerging trend is expansion and use of regional alliances and organisations for out-of-area missions. Currently, 8500 NATO troops are in Afghanistan. Early in August, Eurocorps troops, led by France and Germany, assumed command of the NATO-led International Security Assistance Force (ISAF) from Canada in Kabul. Afghanistan is Eurocorps’ first operation outside Europe since it was formed in 1992. French General Jean-Louis Py will command ISAF. France after some initial resistance and exchange of words in the NATO summit at Ankara in June fell in line with the plan. What’s the current mood at the United Nations? Wary, and watchful, many UN watchers say. The Fifty-eighth General Assembly in its 93rd Meeting (plenary) on August 5, 2004, adopted a resolution “reaffirming the central role of the UN in the maintenance of international peace and security and the promotion of international cooperation” by a recorded vote of 93 member-States in favour to 2 against (Israel, US), with 47 abstentions. The Assembly condemned terrorism, reiterated its call on states to strengthen international cooperation in combating terrorism and reaffirmed that measures taken must be in accordance with the Charter. It called upon states to comply with their obligations under international law and the relevant resolutions of the UN. While introducing the text of the resolution, on behalf of the Non-aligned Movement, the representative of Malaysia expressed serious concern over the erosion and weakening of the role of the UN as the primary interlocutor in addressing global challenges in the political, economic and social fields and in fulfilling its responsibility as envisaged in the Charter and its relevance in the multilateral decision-making process. France and Germany, in a show of solidarity with the European Union (EU) abstained from voting on the resolution. Russia, China, Pakistan and India voted in favour of the resolution. Does the UN appear palsied in its critical function areas? It is unlikely the UN would be able to meet the US challenge. The world would do well to remember that the League of Nations was destroyed by the strong! The BJP is in a quandary these days as it is unable to find a suitable strategy to tackle its temperamental and impulsive leaders like former Madhya Pradesh Chief Minister Uma Bharti. And to cap it, there is no dearth of them in the party. Ms Bharti had announced her “Tiranga Yatra” plan without taking the party high command into confidence. Now that she has begun the exercise, the party is trying to do its best to extend support but these leaders often bowl without setting the field first. Rajasthan Goveror Madan Lal Khurana is another one who is hellbent on coming back to Delhi politics but the party had to put its foot down this time. With another round of tariff wars being over, telephone subscribers are the happiest lot. More so, because the entire country has effectively turned into one “local zone” as national long-distance rates continue to plummet like never before. Industry insiders say that there appears very little scope for any further reduction in tariffs. Instead, the next war is likely to be fought on pulses. In other words, pulses, or the duration of calls, is going to determine the call rates. Already, a couple of players have come out with some kind of plans based on one-second pulse rates. At this rate, the battle could well turn out to be on the basis of micro-seconds if not their fractions. Guess what is India’s greatest strength as a nation? IT? Nuclear power? World’s number two most populous country? The answer, from the international perspective, would be no. Because India’s biggest strength as the world knows is its democracy. In a subcontinent of political turmoil which has seen political upheavals in countries like Pakistan and Bangladesh and the Army ruling the roost, India stands as an island of democracy. It was as a gesture of India’s championing democracy that Afghanistan asked for help from New Delhi for its next month’s elections. On September 14, Indian Ambassador in Afghanistan, Vivek Katzu, handed over a consignment of indelible ink to Afghanistan for use during the forthcoming elections in that country. The ink consignment was handed over to Zakim Shah, Chairman of Joint Electoral Management Body (JEMB) in Kabul. The marker pens have been manufactured in India in accordance with the specifications given by the JEMB. The moral of the story: the Indian ink of democracy is going places. Tourism Minister Renuka Chowdhury believes that the people of this country have to mend their ways for promoting and giving an impetus to tourism. She has outlined her grandiose plans and insists that it requires the active participation of the people be it the national capital or elsewhere. She is proposing a night tour under floodlights to some of the historic spots in Delhi though people might not like to enter the tombs at that late hour. She also spoke about the nasty habit of spitting just about anywhere. Horrified as she was at one such person travelling in a chauffeur driven car at a red light, she got out of her official vehicle and knocked on the gentleman’s rolled up car window. When she rebuked the person in the car of the vehicle, he quietly pulled up the window without responding or even looking at her. She said her driver thought that she was a lunatic to be getting out of her car and trying to admonish people who refuse to change their habits. Contributed by Satish Misra, Gaurav Choudhury and Rajeev Sharma. I, Nanak, do hereby proclaim after due deliberation: Our bond with God’s court is established only through the singing of His praises. And see the Lord within your heart. If you wish to see God, have firm faith in the efficacy of repeating the ‘name’ of Hari and try to disseminate the real from the unreal.